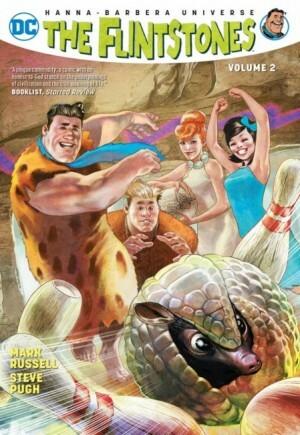 In these surprisingly relevant tales from THE FLINTSTONES #7-12, the semi-civilized denizens of Bedrock face the peril of an asteroid hurtling toward Earth and a renewed battle against the Lizard People! Plus, the family appliances are terrified of Fred's new bowling ball, and hipsters move into the neighborhood! Published December, 2017 (Modern Age) by DC Comics and went on sale October 04, 2017 for $16.99 USD. This issue contains ____ pages in ____, the current NM value is $16.99 USD. I didn't have a perfect experience with this book. Sadly, one of my favorite characters got killed off and it actually left me a little heartbroken. Thankfully, there's a happy ending of sorts to that tragedy. But GEEZ- what did XXXXXXXXX have to die? An enjoyable read with art by Scott Hanna, Rick Leonardi and Steve Pugh. Plus, don't skip over the gallery section as there's a slew of really great variant covers and sketch pages. 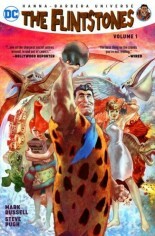 I can't believe I am gonna say this but hopefully, this isn't the end of the new Flintstones!